September’s labor market report is good. So good you should step back, take a deep breath and focus on some context and the trend line. Nonfarm jobs pushed past the pre-recession level in September. You have to go back to September 2006 for a bigger number. 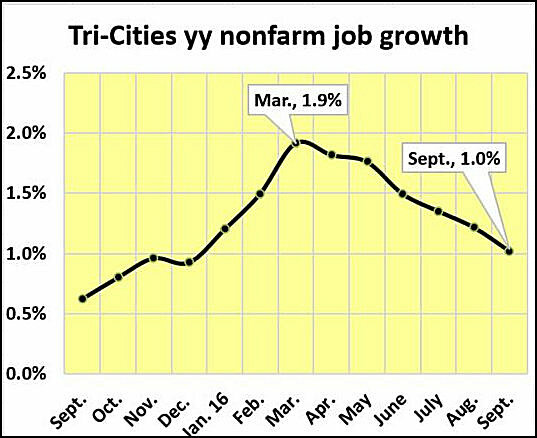 Tri-Cities employment is also up. It’s still not at the pre-recession level, but it’s gaining. The unemployment rate is also up because the stronger job market is bringing people back into the labor force. And, the average private sector wage in the Johnson City Metropolitan Statistical Area made another strong gain. At the same time, Kingsport-Bristol saw its first year-over-year decline since October 2014. Total in thousands of jobs. Clicking on chart renders a larger version. So, where’s the need to step back and look at context? First, the numbers are preliminary and not seasonally adjusted. That means there will be some revision in the October and November reports. It shouldn’t be an issue with the payroll report’s job numbers. The employment data is another matter. After the monthly adjustments, there will be an annual adjustment that has – in the past – changed positive numbers to negative. It’s why the household survey’s employment numbers and the local unemployment rate are an unreliable labor market metric. The next context point is the labor market, and several other local indicator trend lines are signaling slower growth may be just around the corner. Nonfarm job year-over-year growth peaked in March. Since then it has declined every month. Employers are still adding jobs – just at a slower pace. The employment trend isn’t showing that softening, but when the payroll report and employment report are not saying the same thing trust the jobs report. It could be that the biggest headwind for future long-term jobs growth is a slower-growing labor force. September’s local labor force is the highest since March 2014 but remains 15,151 below the pre-recession benchmark. The region’s most current labor force participation rate (54.6%) came in the recently released Census data for 2015. That means almost half of the Tri-Cities 18 years-old and over population is not in the labor force. An aging population is one factor. Another is technology has replaced many jobs. Employers are also demanding workers with better skills. And then there’s the reality that many jobs require workers pass a drug test. Employers are still adding jobs by the growth rate is slowing. Click on chart renders a larger version. In addition to labor market indicators, the growth rate for existing home sales is ebbing. New home construction remains at half of its pre-recession capacity. The seasonally adjusted retail sales tax collections trend is softer. It isn’t as pronounced as the other metrics, but the year-over-year trend has softened for two straight months. Steb Hipple’s third quarter retail sales analysis should provide a better indicator when it’s released. The final context point is the growth isn’t distributed evenly. The three-county Johnson City MSA still has some catching up to do, but it’s now showing stronger job creation, employment, and average private sector wage growth than Kingsport-Bristol. Here’s the breakdown of September’s labor market reports. Non-farm jobs – up 2,600 from August and 1,600 more than September last year. The year-over-year growth rate of 0.8% was the weakest since November last year. There were 300 more nonfarm jobs in September than during September 2008. Employment was 3.1% higher than September last year. That’s the biggest monthly year-over-year gain since February 2007. Compared to the pre-recession benchmark, 13,867 fewer people were employed than September 2008. There were 1,800 more jobs than August and 900 more than September last year. September’s year-over-year growth rate was 1.1%. The rate has been below 1% one time this year. The three-county Johnson City MSA has seen its strongest jobs growth so far this year, and September’s total is 500 more than the pre-recession benchmark. September’s employment was 4.3% better than last year. It’s the best monthly year-over-year increase since before the recession, but employment is still 7,366 shy of the pre-recession total. September’s 5.5% unemployment rate is unchanged from August. The average weekly wage in the three-county Johnson City MSA was $618, up 3.9% from September last year. It was the 14th straight monthly increase and was equal to the September 2008 average. Wages have seen strong increases this year, but not enough to make up for the 36 straight months it declined. When adjusted for inflation against that pre-recession benchmark, private sector workers have $53 a month less buying power than they did in September 2008. The four-county MSA had an 800 more nonfarm jobs than August and 700 more than September last year. The 0.6% growth rate was the weakest showing this year and the sixth straight month it has declined. Kingsport-Bristol has not reached its pre-recession job level yet. September’s total was 200 shy of the benchmark. Kingsport-Bristol employment was 2.4% better than September last year. The monthly year-over-year growth rate has been in the 1.8% to 2.4% range all year. The MSA has 6,531 fewer people employed than it did before the recession. September’s unemployment rate was 5.3%, up 0.1%. The average weekly private-sector wage was down 1.6% from September last year. It’s the first time since October 2014 it has not increased. BLS reports show the average was $630 a week, down from $640 September last year. When adjusted for inflation against the pre-recession benchmark, Kingsport-Bristol MSA private sector workers had $4 a month less buying power. Employment in Bristol was 3.8% better than September last year. It was the 11th straight monthly year-over-year increase. The unemployment rate was 6.1%, down 0.1%. September was the fourth straight month employment has seen a 9% plus increase in the year-over-year rate. It’s 9.7% better than September last year. Johnson City still has 495 fewer people employed than it did September 2008. September’s unemployment rate 5%, down 0.1% from August. Employment saw its best increase of the year – 3.8% better than September last year. It was also the 111th straight monthly year-over-year increase. 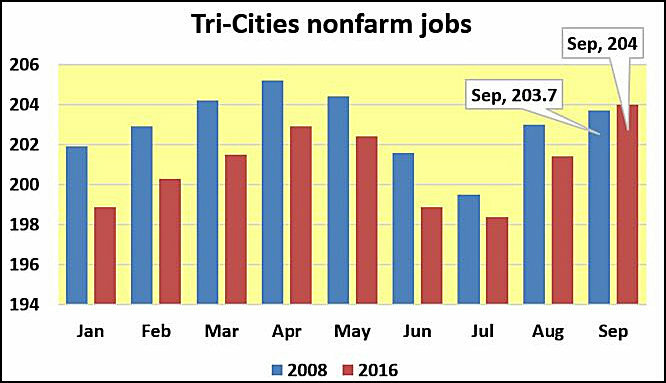 Kingsport in the only major city in the region with a larger number of people employed in September than during the same month in 2008. The current total is 3,841 higher. The employment report covers people who have jobs – not where the job is located. It also counts people who work as little a one-hour a week the same as full-time employees. September’s unemployment rate was 5.8%, up 0.1%.